It’s that time of the week where, once more, here I am, dropping by on this blog to share with you folks my next round of My Top 5 iPad Apps of the Week. This time around for Week #3. I know, and do realise fully, that I am running a little bit late on this series, since when I got it started with this initiative, over in Twitter with #elsuapps, a good number of weeks have already passed by. So don’t be surprised if for the next couple of weeks you eventually seem more than one blog entry on this very same topic. That way we can catch up faster with the ones that I am currently sharing across on a daily basis. And that way walk hand in hand with those I keep sharing through Twitter itself. At the same time, and while I get to share those Top 5 iPad Apps, I thought it would be rather interesting to share, at least, one other relevant link to show how powerful the iPad may well be as well as a business tool (We already how how empowering it is from a personal productivity perspective, right? ;-)). In short, I think it would also be interesting to comment further on an relevant link I may bump into so that we can make this blog entries a bit more insightful than just sharing the apps. No, don’t worry! I’m still planning to keep these posts on the short side of things; so instead of a fully commentary on an article, it will probably be just a pointer for you to head over to what I think would be a worth while reading. And if I bump into multiple links, I may include them all as well. Why not, right? Thus let’s go! “﻿Now decisions at meetings are made quickly thanks to the iPad, he says. MindMeister for iPad: Like I have been mentioning a couple of times already, I do really like mindmapping tools in general and if they are on the iPad, all the better! I could talk about them for ageas! But here we go with another one of my favourites that I have used quite a few times already. In the past I have utilised MindMeister on the Web itself, but ever since it came out for the iPad I only go there to give my mindmaps the last finishing touches. The rest happens inside the iPad app. Remember the mindmap I put together to describe my experiences with “A World Without Email“, that I blogged about it over here a few days back? Well, I created over 95% of it on the iPad in idle moments here and there and in a matter of minutes! And, of course, its synchronising back to the server is just priceless! Taking your mindmaps wherever you go, even when you may not have the iPad with you! Things for iPad: I have tried out a whole bunch of To-Do, Getting Things Done, Executing Action Items apps and Things is probably my favourite. Superb user interface and really nice experience, AND fast!, to add to-dos! Wish I was that quick myself for closing them off accordingly! 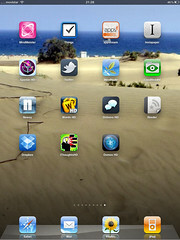 Appstream for iPad: Ever from the very first moment that this app came out I just fell in love with it! Despite the initial repetitive crashes, and the odd one that still happens every now and then, since they released the latest version, it’s one of those essential apps everyone should have. What does it do? It allows you to navigate, through a really cool and engaging user interface, and find other iPad apps that you may be interested in! Really nice! In fact, some of these weekly picks come from apps I have found there! Instapaper: If you are one of those folks who travels on a more or less regular basis or who happens not to have a rather fast or reliable Internet connection where you may well be, Instapaper is probably as good as it gets! What does it do? It allows you to take entire Web sites offline, so you can read them when you are not connected! Ideal for when you are on the plane, or if you have a wi-fi only iPad and there is no wi-fi around wherever you may be going. Sparkle HD: And, finally, the iPad Game of the week! If you have been playing, Luxor or Peggle on the iPhone you more or less will be capable of picking it up rather quick; but at the same time you will love it just as much as with the other, too! Oh, and both the music and the graphics, I am sure, they would remind you perhaps one or two of your favourite movies by an amazingly talented director. Oh, and if you have got some Top iPad Apps of the Week, feel free to share them with us over here, in the comments, and I will cover them in future blog posts as well with due credit, of course. As usual. Thanks for dropping by and till the next one! Hi, Luis. I am thoroughly enjoying your blog and tweets. I work for a large bank here in Spain and the KM effort leaves a lot to be desired. KM as a topic of importance is an uphill battle here. Thanks for keeping up the quality of the blog! My latest favorite app on the iPad is River of News. I’ve been having trouble finding a good app to handle RSS feeds. I’ve used Google Reaader in Safari, Feedler, and gave some thought to other ones. What attracted me to this app was the combination of elegance of presentation and the option to mark items read as you scroll. (You can also click Mark all as read.) Reading workflow with this option on is ideal. The unread count goes down quickly and if I find something worthwhile all I have to do is either read it then and there or star it. It does a fabulous job of keeping the unread count down. A couple of caveats: performance is not always great and it can freeze up temporarily. The developer has an update in the App store pending to resolve this issue. I’ve got a few other favorite apps. Some coincide with yours like Instapaper and Goodreader. I love NoteTaker HD which allows you to take freehand notes (I use a Pogo Sketch). The app has a very, very clever design to facilitate fast note taking. I like Simplenote (which transparently syncs between my iPad, Touch, Notational Velocity on my Mac, and Simplenote on the web). Lastly, Air Display, which allows me to use the iPad as an external monitor on my MBP. The video is transmitted over wifi but for cursory use it’s great.